When you’re sharing an electronic copy of your work from within Office 2016, such as via email attachment, there’s a problem if your recipient doesn’t have the same application in which to view it. For example, if you send a PowerPoint presentation to a friend who doesn’t have PowerPoint, he might not be able to open it. There are two basic ways around problems of incompatibility: Either the recipient acquires an application that can view the files, or the sender (that’s you) can save the file in a format that the recipient can already view. If you are going to tackle the problem from the recipient side, the easiest way is to have the recipient use the free PowerPoint web-based application, found online. (A Microsoft account is required, which is free.) Web-based versions of Word, Excel, PowerPoint, Outlook, and OneNote are all available. They are not as full-featured as the originals, but they work well for viewing and making simple edits. If you are going about the solution from the sender side, first find out which file formats or applications your recipient uses, and then determine a matching file format that your application will save in. You find the file formats available to your application via the Save As dialog box, from which you can select a different file type. For text files, Rich Text Format (.rtf) is a great choice. It’s a near-universal format that almost any word processing program can open, and Word users commonly save in that format when they want to exchange documents with someone who uses a very old or obscure word processing program that doesn’t support Word files. The figure shows RTF being selected as the file format in Microsoft Word. 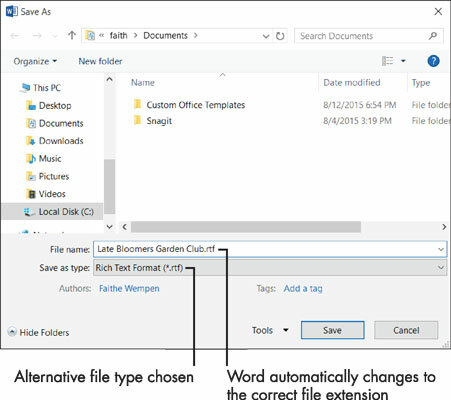 You can choose a Rich Text Format file from the Save as type: field in Word 2016. Changing to a different file format can result in the loss of some formatting. Some features in Office 2016 applications work only when documents are saved in the application’s native format, such as fill-in fields, macros, certain types of editable artwork, and formatting themes. That’s why most people don’t save in other formats unless it is necessary. If the recipient will not need to edit the document, your best bet might be to save it in a special format designed for read-only sharing of laid-out pages: a page description language. That way, the recipient sees the page exactly as you intended it, without having to find and download a separate viewer for that specific file type. PDF: A format created by Adobe, widely used all over the Internet for distributing documents. It doesn’t come with Windows, but a reader for this format — Adobe Reader — is free to download. Yes, the recipient does still have to download Reader, but it’s just one program, and it will work for the content from all Office apps, plus many other documents. XPS: A format created by Microsoft, supported natively in Windows Vista and higher. Anyone who has Windows Vista or later already has this viewer available. Choose File→Save As, and then browse to the desired save location. In the Save As dialog box, from the Save as Type list, choose either PDF or XPS Document. The dialog box changes to show some additional controls. Instead of following Steps 1–2, you can choose File→Export→Create PDF/XPS Document→Create PDF/XPS. (Optional) Change the filename if desired. By default, it’s the same name as the data file you’re working with. Make an Optimize For selection. For documents that might also be printed on paper, choose Standard (the default). For documents that will be shared only online, choose Minimum Size. Click Save. The saved file opens in its native program, which is either Adobe Reader (PDF format) or the XPS Viewer or Internet Explorer (XPS format). 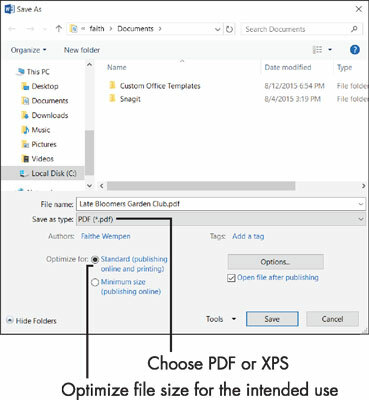 You can choose to save your documents as PDF or XPS files.